Demonstrators marched through traffic along Boylston Street in the Back Bay against the American Correctional Association, a prison accreditation group that is holding its annual conference at the Hynes Convention Center. When Beatrice Codianni was released from the Federal Correctional Institution in Danbury, Conn., in 2008, she left behind a friend named Michelle West, who was convicted of drug conspiracy charges and serving two life sentences without the possibility of parole. West, like many women Codianni met behind bars, spent her days in prison taking classes, working an office job, and writing to friends on the outside. She was a mild-mannered mother who wouldn’t hurt anybody, said Codianni, 67, who spent 15 years in Danbury for racketeering. “I was lucky enough to get out, and I can’t turn my back and forget about the women I left behind,” Codianni said, sitting inside the Old South Church on Sunday before marching in a protest calling for the abolition of prison systems. 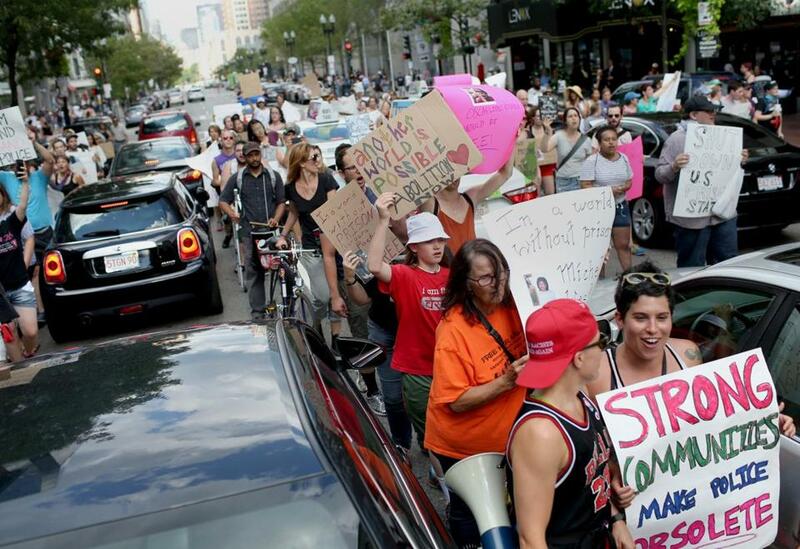 Codianni was one of more than 100 people who marched Sunday from Copley Square to Hynes Convention Center, where the American Correctional Association is hosting its annual conference this week. The message of the march: Imagine a world without prisons. Jason Lydon, national director for Black and Pink, one of the groups that organized the march, said the protest was intended to challenge the philosophy behind prisons. Organizers preached for community collaboration and freedom for all, contending that prisons harm inmates more than help them. In an e-mailed statement on Sunday, correctional association president Mary L. Livers acknowledged the need for improvement within the country’s prison systems and said its leaders have gathered this weekend with that specific goal in mind. She emphasized that productive and safe correctional systems are among their top priorities. Many protesters, including 61-year-old Susan Ringler, said the American prison systems create and strengthen social and economic racism within the country. The coalition of protesters — including the groups Black and Pink, the City School, Families for Justice as Healing, and the Young Abolitionists — faulted the correctional association for putting “a veneer of credibility and professionalism on rampant human rights abuses in prisons across the United States,” organizers wrote in a statement. They cited the suicide of a 43-year-old man at Bridgewater State Hospital in April, a homicide at the same facility in 2009, and the videotaping of strip searches at Western Massachusetts Regional Women’s Correctional Center in Chicopee. These incidents are local examples of human rights abuses the association has allowed across the country, the organizers said. Many protesters also said prison systems have failed in preparing inmates for returning to society after they have served their sentences. Codianni, who was an advocate for prison reform even before spending time behind bars, said inmates are often treated like numbers. Once that stigma changes, the whole system can change, she said.